L-R Pudsey and Bramley's Graham Pearce, John Heneghan, Tim Austin, Mick Hill and Darren Kay applying a bit of pre race pressure to Borrowdale's Mike Fanning. Those wise words of The Cure's Robert Smith went over and over in his head as he fought back the tears. All that hard work.....the training..... the preparation....those winter nights running with a headtorch through the driving rain and wind........the family summer holiday running in 35C heat under a baking sun....what did it come down to....... a little bit of tape needed at the point the route turned up towards the last hill diverting runners unfamiliar with these hills in swirling mists, away from the more obvious trod down towards the finish too soon. Graham Pearce and Mark Roberts on the first climb, Ben Mounsey, Scoffer and Simon Booth behind. Photo by Chris Upson. The strong beat of EMF's classic jumped into his head as he pounded down the hill, crashing through the bracken, sliding over the boulders, leaping on to the trod that he had sought out a couple of hours before. He'd never finished in the top ten in a British Championships race. He had seen all the usual highly placed finishers, hands on knees, pushing their way up the descent that he was now flying down. They had angry looks on their faces. They looked at him and snarled, 'we're going to catch you and make mincemeat of you.....you...... you who didn't go the wrong way'. He descended like he'd never descended before. The split happened between 2nd and 3rd man. A group of about 20 top runners took a clear trod contouring round the last climb and only confirmed their mistake when they saw Morgz coming down towards them, leaving them no choice but to climb the descent line up to the missed checkpoint. And the great song of The The's Matt Johnson started to ring around his head as he realised this year, it was really going to happen. Hampered by bad luck and injury the year before, it still wasn't looking very good at the beginning of the year, but the training had paid off and the pain and injuries had stayed away. He'd done it. He'd find out a few hours later, when his friends remembered to tell him, that he'd broken the course record too, that was the icing on the cake or the cheese on the beefburger if you were looking for beefy metaphors. New Olympic Sport - Synchronised Running - Calder Valley's Linda Murgatroyd and Keswick's Rachel Slattery elegantly sprint for the line. Photo by Chris Upson. Her rival had been leading her all the way round the course, but she knew at the back of her mind she'd get down that last descent quicker. But she didn't imagine she'd get down as quickly as she did, her footing slipped, something happened, she couldn't stop, she slid down the near vertical boulder strewn grass at great speed, she still couldn't stop, she screamed as her bare skin burnt with the pain as she slipped down over a hundred metres. She came to a halt as she reached the bottom of the hill, the pain was unbearable, with cramp all through her legs. But she got herself up and ran towards where she thought the end was. She collapsed in the finish funnel with agonising cramp throughout her legs. Her rival arrived seconds later, picked her up and pushed her over the line ahead of her, not wanting to steal a point from her in the championship classification. Now if you are one of the many who went away thinking like our first man, well you've probably already bounced back and are planning what races you will be doing next. For those thinking like the second man, you know you were lucky, but Lady Luck has always been your friend, so it will happen again. Those of you who are like the third man.....well you've just got to keep doing the same, and contemplate on simply how much rest you can afford yourself over the winter. If you are like our last lady, we hope the pain goes soon and the bruises heal quickly and remember REM 'Everybody Hurts' sometimes. So the British Championships are hung, drawn and quartered. Relay season's up next with the Ian Hodgson on 2 October and the FRA Fell Relays on 15 October. 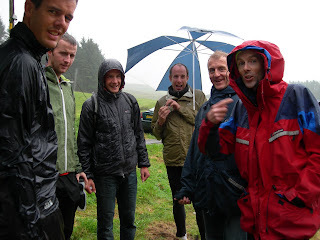 Fell Running Briefs will be there watching, listening and sometimes participating, purely to appreciate really how tough these men and mountains really are, and writing down anything interesting on soggy bits of paper for you. Thanks Sarah - Happy healing!